I finally had a chance to install the new SawStop Z.C.I. 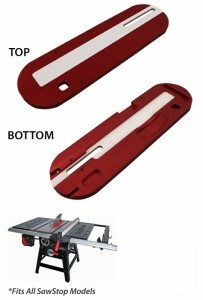 Aluminum body throat plate, available at Infinity Cutting Tools www.infinitytools.com, in my SawStop this weekend. It’s nice to have options when it comes to items like zero-clearance inserts for table saws and this one has some nice bells and whistles. This is just a sneak peek at the throat plate being installed and prepped for use. I’ll share more about it’s overall use when I release the SawStop review episode during Safety Week 2013. In the meantime, if you’re a SawStop owner and were considering ordering a zero-clearance insert for your saw, now you have another option over the manufacturer’s. Follow this link to Infinity Cutting Tools www.infinitytools.com to learn all about it. diffrent blade widths without having to purchase a whole new one just to have it wear out. I like the idea of being able to swap them in and out as needed. Yes it’s very one sided at the moment in regards to manufacturers, but they’re looking to expand from my understanding…to Powermatic next lol. can I do a 45° cut with the insert that comes with the saw? Yes, I did it quite frequently. You mean the original manufacturer one? Or the Z.C.I insert? Either one can handle it. Copy– I was referring to the one on the saw–once I do a 45 is it no longer a zero clearance for a 90? Depends on what side of the blade you’re cutting? If you’re waste material is on the left of the blade than it’s could still be zero clearance”ish” in the sense the right side of the throat is still close to the blade. « March schwag comes in like a lamb but will go out like a LION!! !